This policy paper examines what are, currently, the biggest vulnerabilities of the peace agreement signed by the Colombian government and the guerrilla movement known as the Revolutionary Armed Forces of Colombia (FARC) in November of 2016. The triumph of Iván Duque—candidate of the Centro Democrático party (the party of former President Álvaro Uribe) and a leading voice of the “no” campaign against the accord—in the elections of June 2018, together with the likely majoritarian alliance of the political parties who have publicly opposed the peace agreement, make the future of the accord a central question in Colombia. The paper starts by examining the measures taken by the Santos administration to make the agreement legally binding, both nationally and internationally. It then discusses the implications of the decision of the Constitutional Court regarding the constitutionality of the legislative act implementing core sections of the agreement. It explains that, while the Court weakened the accord’s legal binding by limiting the extent to which it could be incorporated into the constitution, it did safeguard the agreement in the medium term by requiring that the next three administrations implement it in the spirit in which it was signed. We then examine the routes through which those opposed to the agreement could decide to undermine it. First, we look at what we call the apocalyptic options: the convening of a referendum aimed at eliminating the constitutional reforms that have been passed in order to implement the agreement and the convening of a constitutional assembly. We then turn to those areas where changes can be undone via regular legislative procedures or by policy implementation. The paper narrows down the analysis to three areas seen as the most critical: the transitional justice system, the compatibility of the sentences of FARC leadership and their political participation, and the question of illicit drugs. For those set on undoing significant parts of the agreement, the focus will likely be on the Special Jurisdiction for Peace (JEP). After examining how the JEP has been weakened vis-à-vis its original conception in Havana, we detail why the uribismo wants to remove the military from the JEP’s jurisdiction: first, by arguing against the equivalency between crimes the military might have committed in the course of the war and those committed by the FARC, and then by questioning the impartiality of some of the judges chosen for the JEP. Removing the military from the JEP would critically undermine the concept of a transitional justice system designed to think holistically about the multiple actors and responsibilities of this complex conflict. The paper then examines the challenges involved in finding a way for the FARC leadership to serve their sentences while at the same time guaranteeing their right to participation, especially considering those FARC members who were chosen to fill the ten seats in Congress assigned to them by the agreement. The paper analyzes the political pressures the JEP faces to guarantee justice is served while simultaneously respecting the need to uncover the truth. We examine the repercussions the agreement, and efforts to overturn or undermine it, will have for the future of the FARC as a political party. We then turn to the question of illicit drugs and examine two main issues: first, the possible impact of Duque’s campaign promise to eliminate the legal understanding of drug trafficking as a political crime, which entails amnesty or lighter sentences for those involved in drug trafficking with the purposes of financing the rebellion. While the legal repercussions of this reform seem minimal for the FARC, the legal uncertainty that this brings to the process could be dangerous to its implementation. Second, we examine Duque’s proposal to eliminate programs for coca growers to voluntarily eradicate their illicit crops and instead make all eradication compulsory. Forced eradication efforts in Colombia in the past have shown that this method is not effective in reducing the amount of coca entering the market. Moreover, recent developments indicate that eliminating the voluntary programs would further endanger already vulnerable populations. The paper ends with a quick examination of a final strategy that the new administration could use, i.e., further slowing the pace of implementation, and briefly examines the problems with the reincorporation process. 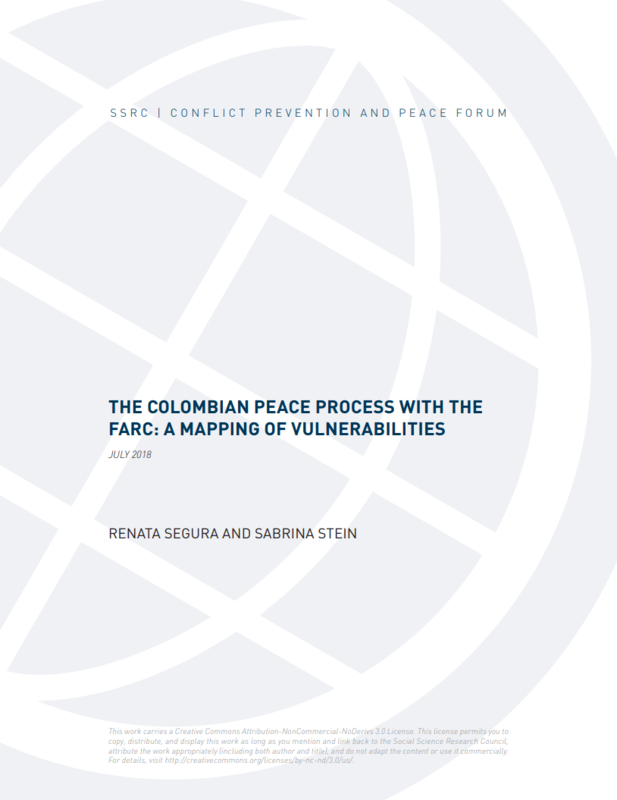 The Colombian Peace Process with the FARC: A Mapping of Vulnerabilities, Segura, Renata and Stein, Sabrina (July 2018).